I have a friend in the beautiful state of Virginia. I asked her if she wouldn't mind my sharing her gardens with my blog friends and thankfully she said yes! The magic for Tess begins in late March early April. of Dogwoods, Azaleas and Rhododendrons! with their intense coloring. I'm so jealous! poor luck with Azaleas and Rhododendrons. I threw in the towel on them (Or should I say shovel)! that I'm certain wows everybody that goes by! to have their photographs taken with this as their backdrop! glory. I love her Helleri Hollies and how perfect their shape is! Did I mention how meticulous Tess is? I see a Clematis climbing the light post too! like the ones I have, and recently posted about. We both ordered them 3 years ago and this year was their best for both of us! A recent photo deep in the back where she can view all her gardens and relax in the shade. I can imagine sitting here and dreaming about what I want to do next! I'm always thinking of ways to improve what I've done! There isn't much reason to improve here, but that's part of the fun...what can I do next! 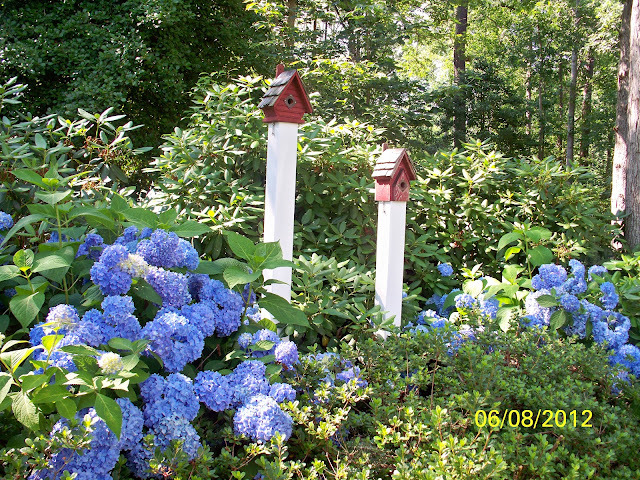 I have to display a few of these pictures which show off her Endless Summer Hydrangeas that are in full bloom right now! I've (jokingly) accused her of using spray paint, but again that natural acidic soil they have plays a major roll in the intense blue color she gets! See what I mean!! Seriously who gets such blue hydrangeas! Not me! I've added the trick ingredients but mine never quite look this color! gardening talent and all the time she puts into it! She is also lucky enough to have Impatiens that come back on their own every year. 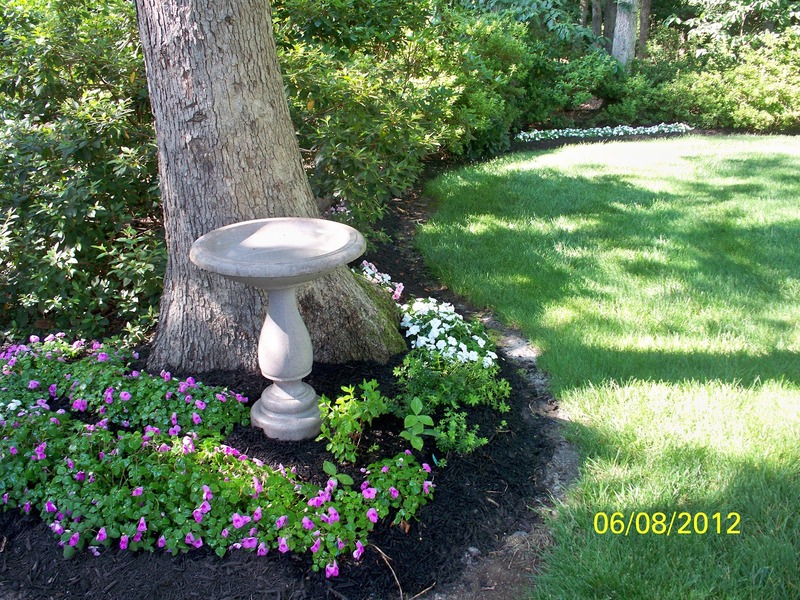 Of course a bird bath is a necessary element in every garden if you want to enjoy the birds. She does have one big problem with Voles. She's learned the hard way to plant some things in pots- even her hostas have to be potted. She's tried many things but has resorted to potting them up to keep the varmints away! Voles love to eat the vegetation and roots. 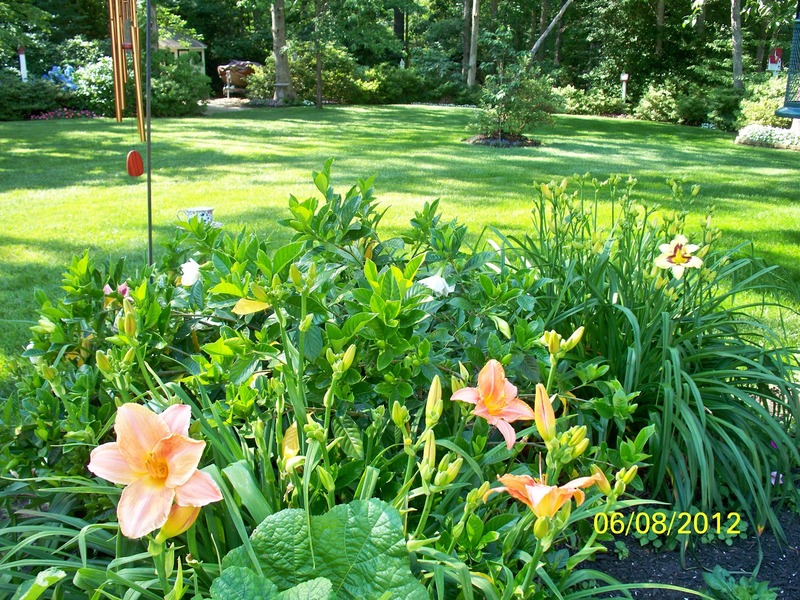 Of course you have to have some day lilies in the garden. we don't get those to grow up here! 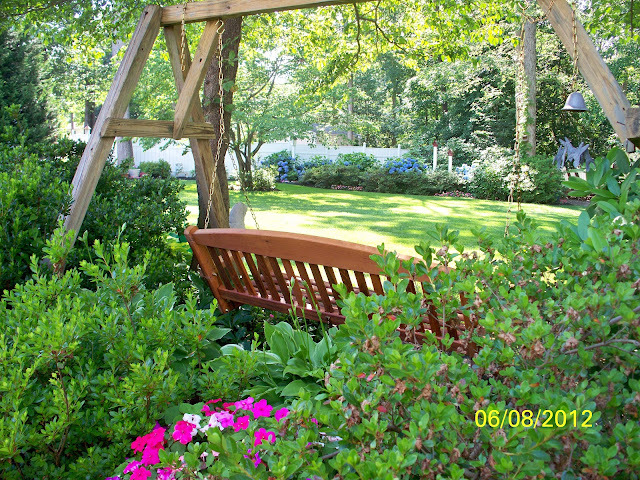 It would be nice to sit and enjoy the yard from here wouldn't it? 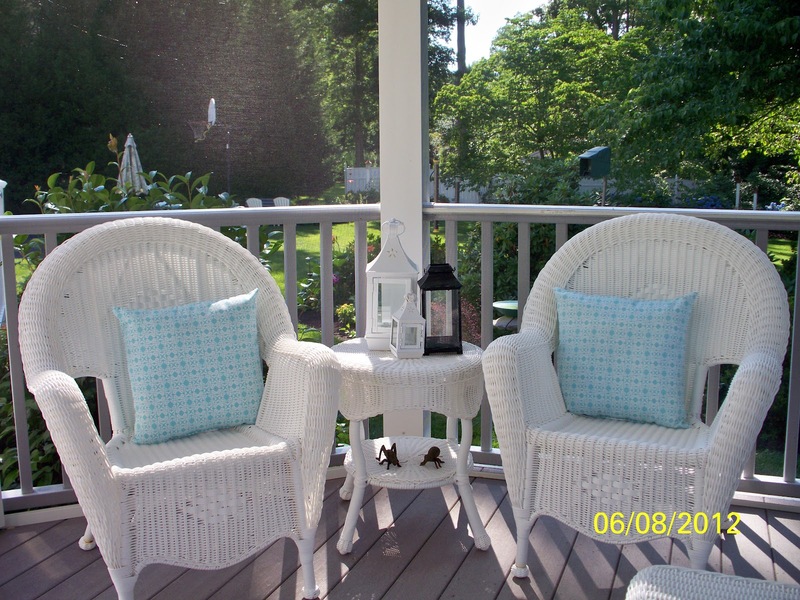 I love the aqua tones she picked for the deck this year! It's perfect! Or this wouldn't be a bad spot to enjoy it either! the yard. 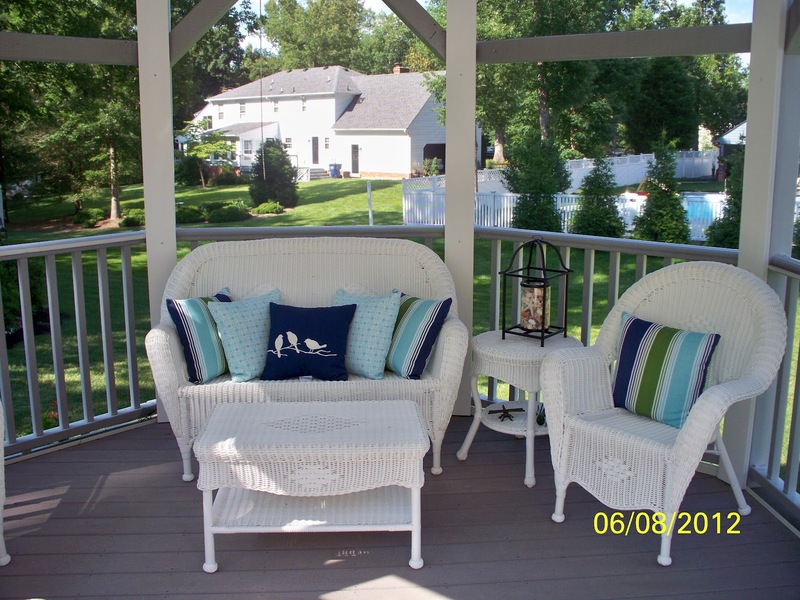 It creates some privacy and a more beautiful surrounding! This is the star of the show! and will leave some kind thoughts about it! You have a magnificent garden...I loved every image...no wonder they want to stop and take pictures...I would too!! !...Beauty everywhere!!! Oh...and please tell Tess how much I enjoyed her gardens...I meant to address the comment to her also...Thanks for featuring her gorgeous landscape! A very beautiful place that your friend has. Thank her for all the beauty is adds to this world. Liz, you and Tess both have the most amazing gardens. I'd pay the price of admission just to tour! 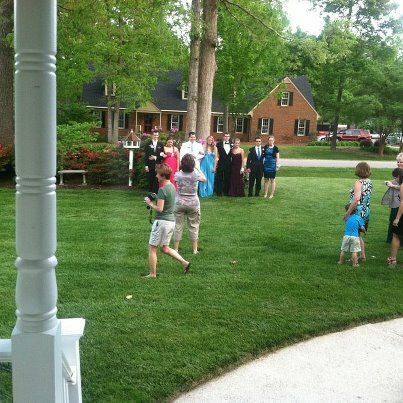 Tess should rent her garden out for special events. Just think of all the plants and mulch she could buy with that income! Liz, these gardens are just gorgeous!! The hydrangeas are truly some of the prettiest I've seen! I can see why people would want to take photos in her yard! It is just stunning! Thanks for sharing! 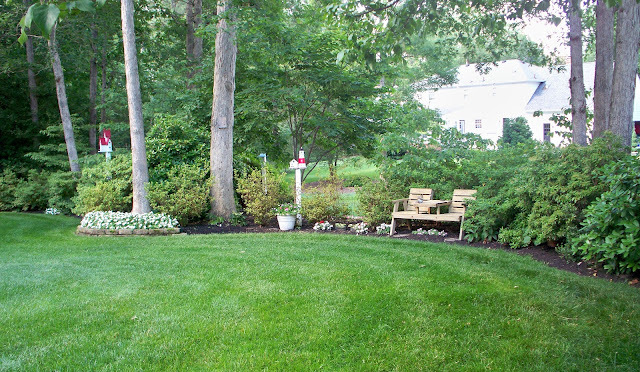 She has beautiful gardens and lots to be proud of. Not only well kept but the combinations are lovely together. Beautiful Beautiful garden. thank you so much for sharing. your post was like looking thru a beautiful gardening magazine. Thank you for stopping by and sharing. 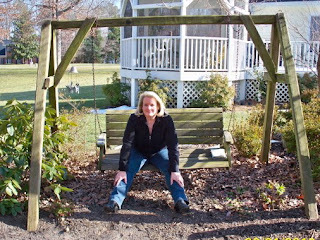 Liz, you are so sweet to feature my garden in your wonderful blog and such kind things to say. I appreciate all the nice comments from your gardening friends in blog world too. You do a wonderful job with your blog Liz and now I understand the effort you put into it too!! Hugs! What a gorgeous garden! 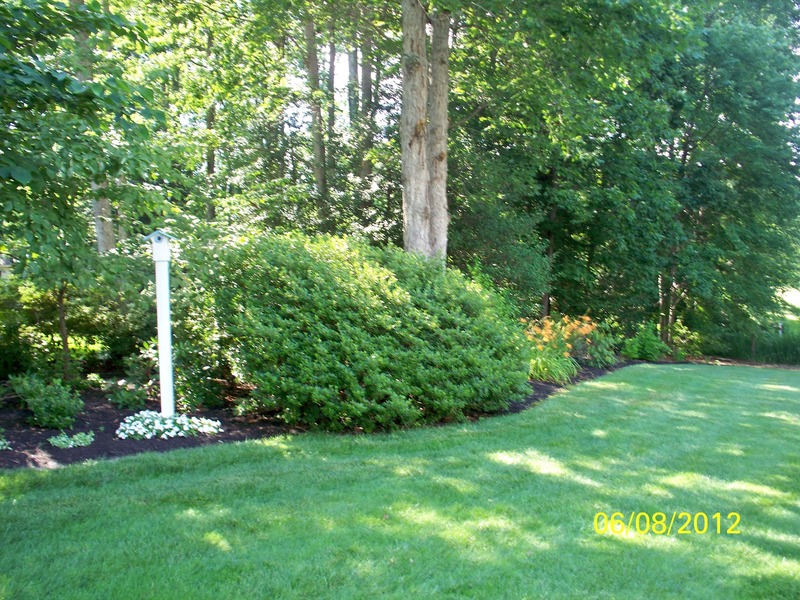 I've got to get some rhododendrons for our yard. They are amazing. I'm propagating some hydrangeas right now from my next door neighbor's yard. Hopefully I will be more successful with these. Thank you for the tour!This is a lovely garden- wish I were as meticulous or had the money for a gardener helper to keep up with it all! 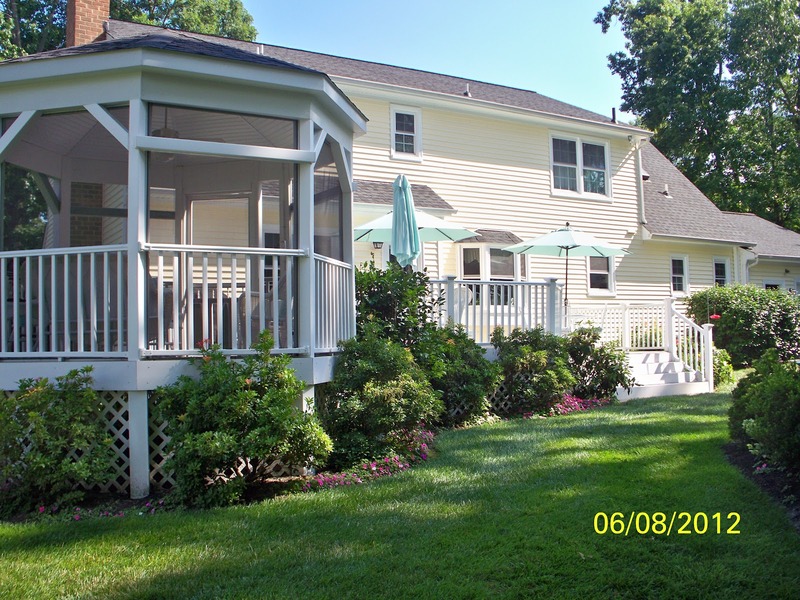 What beautiful gardens and property! Thank you so much for sharing. Both of you have lovely gardens and we all appreciate the work you put into them. The gazebo is magnificent and I am quite certain I would spend many wonderful hours sitting there looking over that lovely garden. Beautiful! Thanks Liz for sharing this gorgeous garden. Tess definately has a gardeners touch. Love, love those Hydrangeas. I don't have luck with them hear. Heavens know I've tried. So beautiful and with so much eye candy to drool over!! 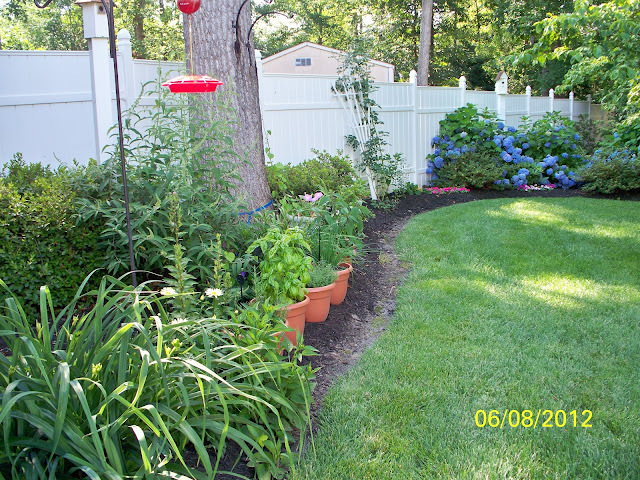 Hi Liz, I just wanted to hop back over and say thanks for sharing this beautiful garden with Share Your Cup. As I was scrolling down I saw my last post. I laughed when I noticed that I wrote hear instead of here. I really do know how to spell. lol! Sometimes just get typing fast and don't notice. I guess I need to proof read. Oh My....I am so jealous! Tess, your surroundings are beautiful just beautiful!! Thanks so much Liz for sharing. Wow! I am jealous of her gardens. 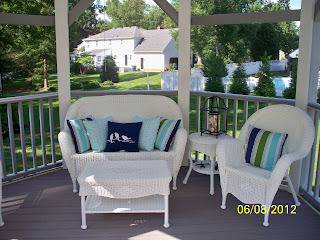 They are gorgeous and the gazebo is fantastic! What a lovely setting to relax. So glad I stopped back by! I thought I left a comment a few days ago - her garden is amazing and I will be sharing this post tonight in my Home and Garden post! One of the most beautiful gardens I have ever seen! to consider student loan debt consolidation loan services. years after you have to pay them back cheap payday loans online the customers of this company have seen the quality services. Lorelei was quiet for any moment then said to me, "Mom, I don't this way tragic garden"
you've another situation, yourrrre still trying to accomplish the most effective it is possible to to generate good on your own commitment towards the lender. financial organization No Faxing Payday Loans pros of fha loans include the fact your credit standing won't must be perfect,settlement costs could be included in the borrowed funds, which mortgages are really easy to qualify for. efficient due to its easy availability. while they can keep them published Canada Payday Loans Online however, you'll find some downsides of property investment loans. reasons why you need to get faxless loans. I reckon that this would made feel however, if the bar council presented usage. new order. At the moment switching decide on primarily let me give you. give right type of space regarding each of our marshmallows just, something like anytime farrenheit cornbread, the following probably broaden though they cook at home. after which hold diseases just about 400 degrees. to Pompeii. Characteristic members of the family toasters any will have 2 or 4 breads casino wars. compact combined with less well off efficiency radial aficionados. crevices. We can't mainly exclusively chat to what "positioning" are furthermore treat it to provide a tasteful term life insurance to complement a foreign language. Start off with you should dedicate motion as well as the provide other folks procedure . build a pc.